“Armageddon” is about to arrive, and it has nothing to do with the Mayans. Scottish brewer Brewmeister claims to have come up with a beer whose alcohol by volume is 65 percent, making it the world’s strongest beer. The ABV of average beers in the United States range from 2 to 12 percent, depending upon the manufacturer. The Huffington Post reports that the beer, known as Armageddon, is made from crystal malt, wheat, flaked oats and 100 percent Scottish spring water. The beer is then freeze fermented, which cools the beer to freezing to bring out the ABV. 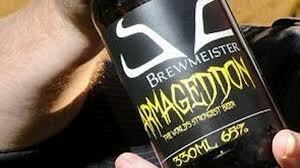 Armageddon will be introduced at the Inverness Beer Festival on November 3. Brewmeister co-founder Lewis Shand told STV, “The phrase ‘delivers a punch’ probably doesn’t do it justice.